Access restricted to WSU students, faculty and staff,Copyright Andrew Tash, 2006. All rights reserved. Copyright Amelia Hendra, 2006. All rights reserved. Access restricted to WSU students, faculty and staff,Copyright Lenn E.Shipman, 2006. All rights reserved. Access restricted to WSU students, faculty and staff,Copyright Shelly Walston, 2006. All rights reserved. Access restricted to WSU students, faculty and staff,Copyright Sarah Elizabeth Gegen, 2006. All rights reserved. Copyright Chirag Amrutbhai Patel, 2006. All rights reserved. Copyright Laura Ferguson, 2006. All rights reserved. Copyright Harish Venkateshappa, 2006. All rights reserved. Copyright Sandeep Kumar Shetty, 2006. All rights reserved. Are women still experiencing gender discrimination in income and employment positions? Access restricted to WSU students, faculty and staff,Copyright Mark Pettinger, 2006. All rights reserved. Copyright Krishna-Prasad Bangalore, 2006. All rights reserved. Access restricted to WSU students, faculty and staff,Copyright Amit Chib, 2006. All rights reserved. Copyright Avinash Basavraj Lakkundi, 2006. All rights reserved. Copyright Kellie Sue Birmingham, 2006. All rights reserved. This course examines the political, economic,military, and ethical factors affecting the use and utility of military force in international relations. Students will study the political and decision-making process by which nations decide to use military force as well as the major arms control agreements of the post-World War II period, including negotiations currently under way. 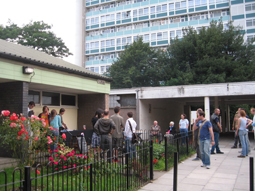 STATE OF PLAY: Research residency commission by the South London Gallery to establish performative dialogues with the inhabitants of a housing estate in Peckham. Work culminated in an exhibition and video installation in a flat on the estate.